OVERSIZED ITEM: Please Call to Order. Enabling children of ALL abilities to play TOGETHER side by side! 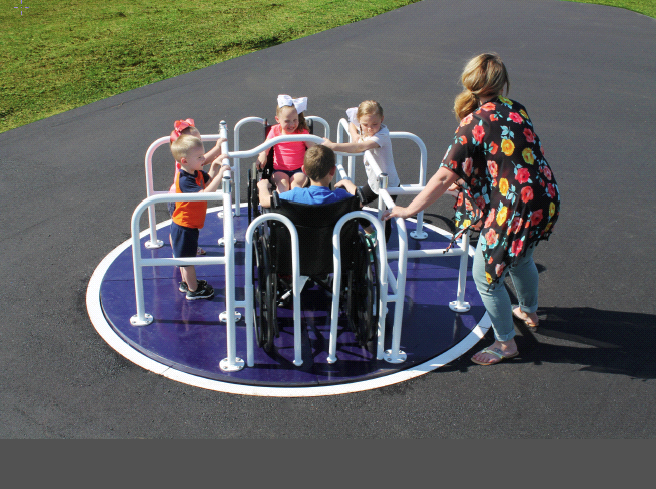 Like the other merry go round models, Sportsplay's new wheelchair accessible merry go round comes in your choice of three fun color combinations: Red with Yellow handrails; Green with Tan handrails; or Purple with White handrails. Wheelchairs roll onto the merry go round deck easily. There are two separate wheelchair accessible positions, which are secured with swing gates. The swing gates allow quick and easy access. The gates must always be in the fully closed position—and wheelchair brakes applied—when the merry go round is in rotation. Multiple handrails allow children to hold on securely and push themselves to set the merry go round in motion. This product must be installed utilizing poured in place rubber safety surfacing or rubber safety tiles, ensuring a flush surface fit. An access panel in the deck easily allows routine maintenance such as greasing and monitoring/adjustment of the governor for speed control. Adult supervision is recommended. 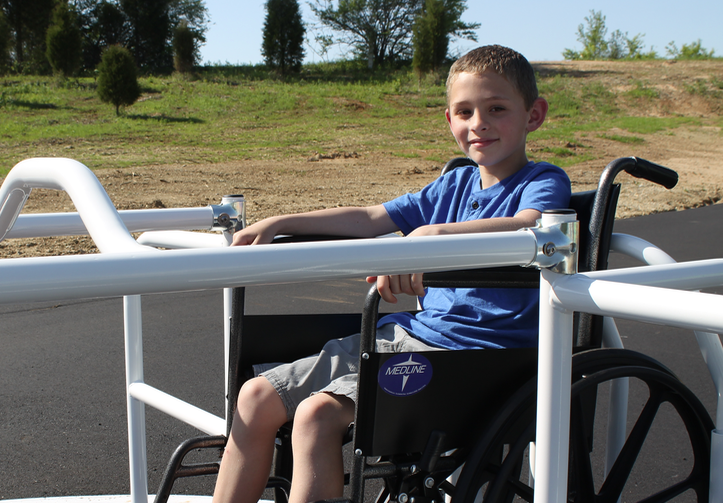 The new Wheelchair Accessible Merry Go Round is 8' in diameter and can accommodate two wheelchairs, with 10-12 children total, ages 5-12 years. A Use Zone of 20' diameter is required. Includes a governor for speed control. Weight capacity is 5,250 lbs. max. Capacity is 10-12 children, including 2 wheelchairs. Offered in Red/Yellow, Green/Tan or Purple/White. Use of poured in place rubber surfacing or rubber safety tiles required with this product. For PDF Documents you will need Adobe Acrobat CS2 or better, or Acrobat Reader . For DOC Documents you will need Microsoft Word 2003 or better, or Word Viewer .